Italian prosecutors have opened an investigation into sales of wine with Nazi leader Adolf Hitler on the label. They were alerted to the wines after Philadelphia lawyer Matthew Hirsch came across the bottles in a small supermarket in the northern town of Garda while on holiday with his wife, according to Italian newspaper Corriere della Sera. 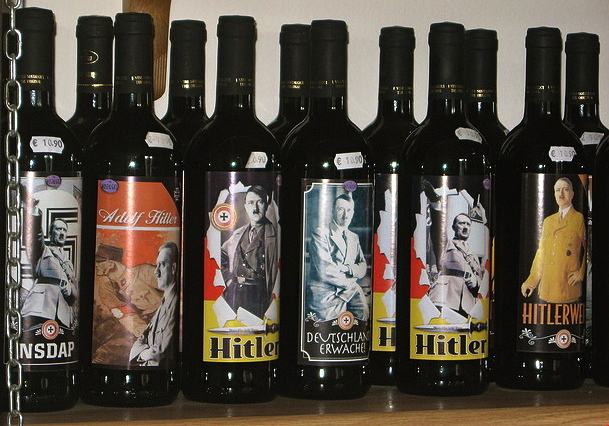 One of the bottles features Hitler performing the Nazi salute, another the dictator alongside the words Mein Kampf, meaning “my struggle” in German, and a third depicting Hitler posing with a manipulated photo of the late Pope John Paul II. Hirsch struck upon the bottles with his wife Cindy, whose aunt and grandparents died in Auschwitz and father is a Holocaust survivor. “I was shocked. It is not just an affront to Jews, despite my husband and I being Jewish. It is an affront to humanity as a whole,” Hirsch told Corriere della Sera. “The only crime that could be currently attributable to this is that of apologising for fascism,” prosecutor Mario Giulio Schinaia told news agency Ansa. “At this point though, it would be opportune to invent the crime of human stupidity,” he added. “I want to reassure our American friends who visit our country that our Constitution and our culture rejects racism, anti-Semitism and Nazi fascism,” said Italian integration minister Andrea Riccardi. “This offends the memory of millions of people and risks compromising the image of Italy abroad,” he added. It may or may not be a violation of Italian law; I’m not a laywer and I don’t even play one on TV. What I do know is that this is in exceedingly poor taste, horribly poor taste. I have to wonder about the producer’s or distributor’s motivations. Do they seriously believe that this is good marketing? Even if this was a re-labeled bottle of one Italy’s grandest wines, I would not buy or serve it under any circumstances. It is disgusting! Sort of like cutting two-buck-chuck with kerosine. I’m an Italian American Jew and very proud of my heritage. These bottles are an insult to Italians/Jews world wide and to all who suffered during WW2. I can’t believe that there is a market for this ! I forgot to add that I totally agree with Cook’s comment. Politicamente incorreto e com intenção clara de chocar.